System Integration Market size was estimated at over USD 250 billion in 2016 and is predicted to grow at 6% CAGR from 2017 to 2024. The system integration market is anticipated to gain traction during the forecast timeframe owing to the increasing demand from organizations to increase the efficiency of their existing systems and create a smooth coordinated system is causing organizations to adopt these services. Systems that are not integrated also result in a significant increase in the cost and resource consumption, mandating the need for these services. Organizations situated across the world are influenced by technological trends, such as big data management software, hardware and software solutions, and mobility applications. As a result, there is a strong need to standardize business processes and reduce the complexity leading to the growth. The high initial costs associated with using these solutions and the lack of the appropriate network and broadband infrastructure are the major factors hindering the growth of the market. SMEs, primarily, have very severe restrictions on the financial budgets owing to which a large number of businesses experience difficulty in gaining access to these services. However, the provision of low-cost and highly skilled labor is lowering the overall costs of these services and is anticipated to drive the industry demand in the long term. The rising proliferation of the internet and its effect in daily activities, such as payment and retail, are increasing the demand for the system integration industry. Furthermore, the advent of outsourcing of the various business and knowledge processes are leading to the high focus on these technologies. Advanced technologies, such as adopting mobile channels to reach their customers, are driving the industry as businesses are increasingly adopting mobile channels to reach their customers. 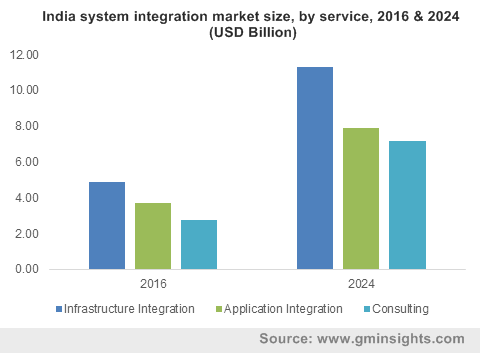 The system integration market segmented by services includes infrastructure integration, application integration, and consulting services. The infrastructure integration is further divided into building management systems, integrated communication, data center infrastructure management, network integration, and cloud integration. The building management system holds the largest market size as these are essential components in every organization irrespective of the sector. System integrators monitor the entire electrical and mechanical equipment such as elevators, ventilation, and lighting. The consulting segment of the market is anticipated to gain traction in the coming years as businesses are increasingly seeking services to transform their business processes to maximize efficiency and productivity while identifying and reducing the additional overheads and unforeseen costs. The segmentation of the industry by end use indicates that IT and telecom are anticipated to hold the significant share in the system integration market owing to the rising demand for broadband and communication services across the regions. China, for instance, has introduced a five-year plan to provide internet connectivity to rural and underserved locations, generating a demand for these services. Additionally, changes in the technological landscape, such as the evolution of 5G networks and migration from wired to wireless services, and the increase in IT and business consultancy services. The BFSI segment of the market is exhibited to witness a rapid growth owing to the need to mitigate risks and reduce ownership costs, increase operational efficiency, and improve business processes and systems. Furthermore, there is a large amount of data and the amount of security that is generated such as consumer financial information. The industrial boom in the Asia Pacific region, primarily in economies including India and the Philippines, is a major factor driving the growth of the market in this region. Furthermore, government initiatives, such as the Made in China 2025, are supporting the growth of SMEs and locally-produced technologies and services are fueling the growth. The low costs of raw materials, such as labor, electricity, and raw materials, are causing foreign players to outsource their activities such as consulting and business knowledge processing to players operating in the region. The vendors in the system integration market include Tech Mahindra, Oracle Corporation, Hitachi Ltd., Cisco Systems, Inc., Hewlett-Packard, Fujitsu Ltd., Deloitte, Capgemini, Accenture, and CSC. The players must invest heavily in activities such as new service launches and geographical expansion of their solution offerings. Additionally, the industry is subject to constant changes in technology and regulations owing to which service providers are required to constantly evaluate and upgrade their service provisions. In February 2015, Elmo Solutions announced the launch of the Agni Link CAD-ERP Data integration system services for Microsoft Dynamics NAV 2016 platform, allowing the company to strengthen their growth in the market. 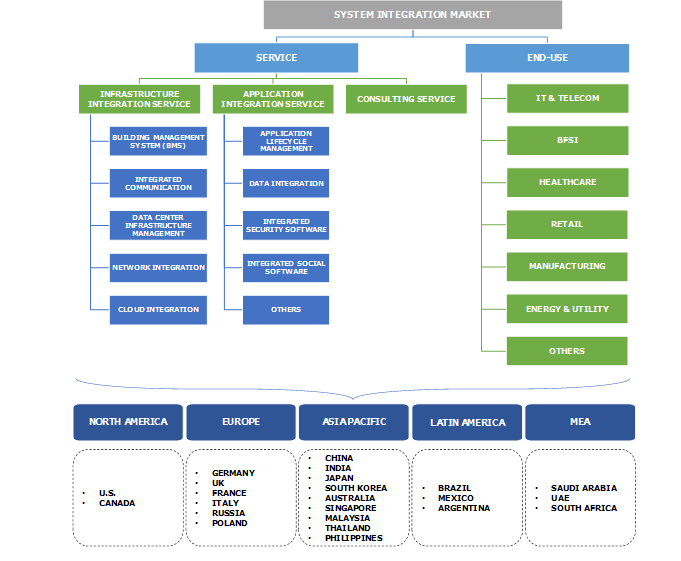 System integration market enables companies to create a unified system in place of the component sub-systems comprising individual hardware and software solutions and to ensure that these functions cohesively with each other. For instance, a company providing these services to a business seeking to integrate robotic automation technologies in their manufacturing process is required to understand the space, inventory capacity, and production demand and provide a customized consulting and recommendations on which robotic technology to choose. Furthermore, they are also responsible for the integration the automation with the existing infrastructure and applications. The players provide a vast array of solutions that can be customized according to the requirements of the user such as size, organizational structure, and financial budgets. The market comprises a large number of players dispersed across the world owing to which each market player holds small market shares. Furthermore, consumer demands are highly variable and constantly change with respect to the technological changes, regulations, and the demand that is generated.